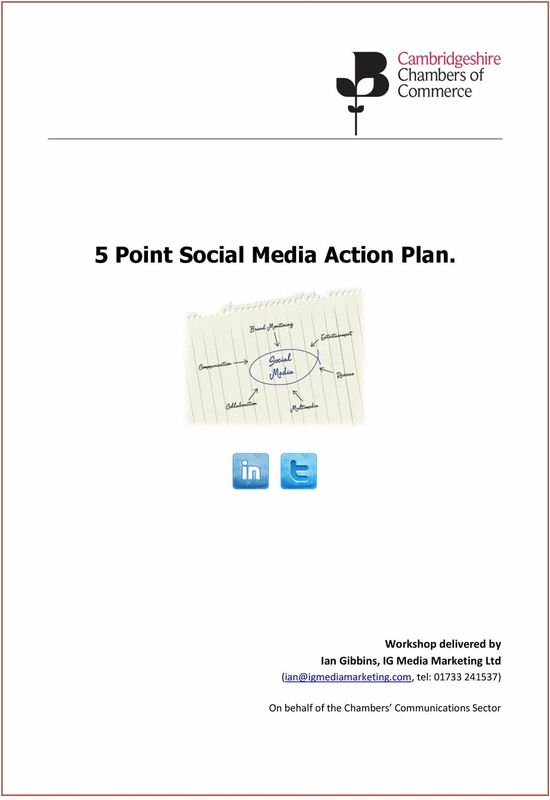 Download "5 Point Social Media Action Plan." 2 Introduction: There is a whole world of information and buzz around the social networks such as Facebook, LinkedIn, twitter and YouTube, but how many business owners and organisations truly know how to use their time effectively on these popular platforms? How many can tell you the results they ve had from implementing social media? How many even have a strategy or a plan!?... Many organisations are looking for ways to capitalise on this potential and leverage it for increased online reach. Unfortunately, most of these organisations have no idea where to start, or whether social media can be an effective business channel for engaging with their target audience. Social media is not about being in the face of your customer selling your latest state of the art product or service. No matter how passionate you are about it, this is not the place to be salesperson of the year! Social networking is far more subtle than that; it s about getting to know real people and building relationships and gaining trust through delivering and sharing information that is valuable to your visitors. Social networking should be used to define your audience, locate your potential customers, build a social relationship with them and then proceed to promote your brand and website. Connected, informed and sustained customer engagement through social media, blogs and online communities can significantly improve customer acquisition, customer retention, search engine rankings and an organisation s overall standing in the market place. However, in order to achieve this, an organisation needs to clearly define its goals and its audience in short it needs a comprehensive social media strategy. 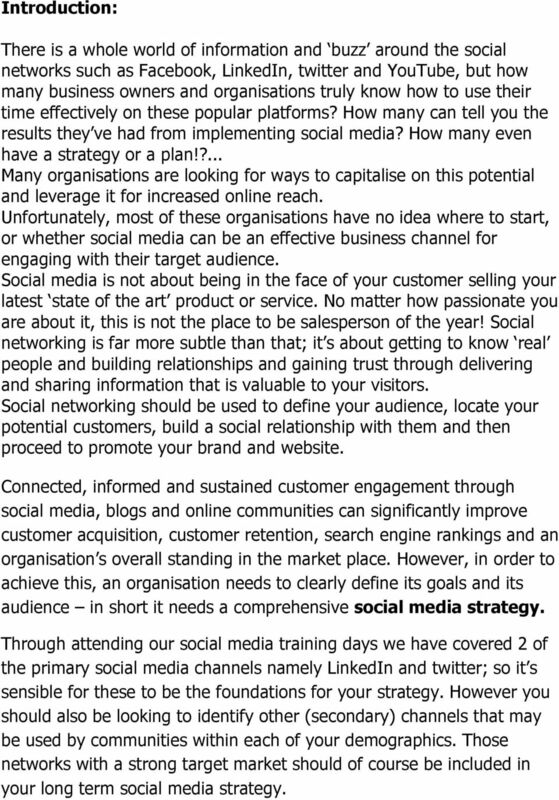 Through attending our social media training days we have covered 2 of the primary social media channels namely LinkedIn and twitter; so it s sensible for these to be the foundations for your strategy. However you should also be looking to identify other (secondary) channels that may be used by communities within each of your demographics. Those networks with a strong target market should of course be included in your long term social media strategy. 3 Step 1: Goal Setting. 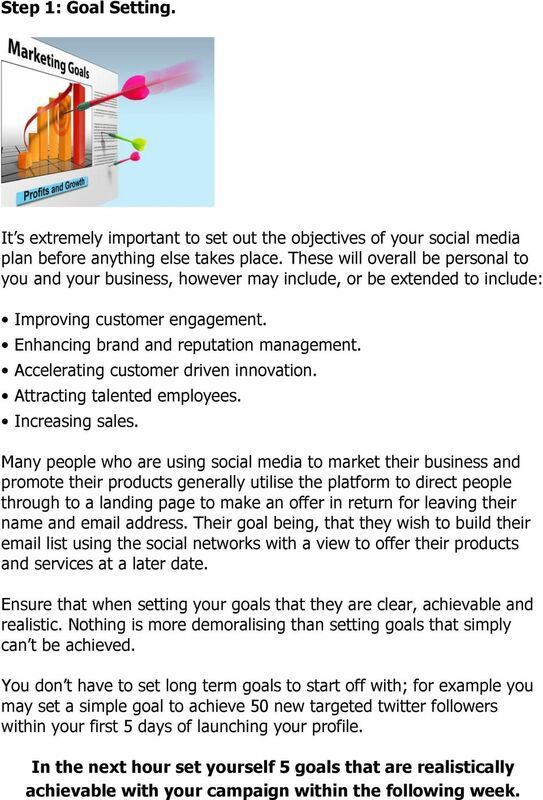 It s extremely important to set out the objectives of your social media plan before anything else takes place. These will overall be personal to you and your business, however may include, or be extended to include: Improving customer engagement. Enhancing brand and reputation management. Accelerating customer driven innovation. Attracting talented employees. Increasing sales. Many people who are using social media to market their business and promote their products generally utilise the platform to direct people through to a landing page to make an offer in return for leaving their name and address. Their goal being, that they wish to build their list using the social networks with a view to offer their products and services at a later date. Ensure that when setting your goals that they are clear, achievable and realistic. Nothing is more demoralising than setting goals that simply can t be achieved. You don t have to set long term goals to start off with; for example you may set a simple goal to achieve 50 new targeted twitter followers within your first 5 days of launching your profile. In the next hour set yourself 5 goals that are realistically achievable with your campaign within the following week. 4 Step 2: Your Listening Strategy. Believe it or not, people will be talking about you, your business, along with your products and services online whether you like it or not! So, it s far better to find out exactly what is being said; for instance what problems are people having? What do they like about your business? What else can you offer them to make their life easier? The list is endless But listening to these conversations before engaging is something all business owners should seriously consider. So, with that in mind, it is very important that a period of detailed investigation and analysis takes place before any implementation of/or engagement across the social media networks. The investigation will provide the foundation data and bench-mark criteria on which to build your social marketing strategy. 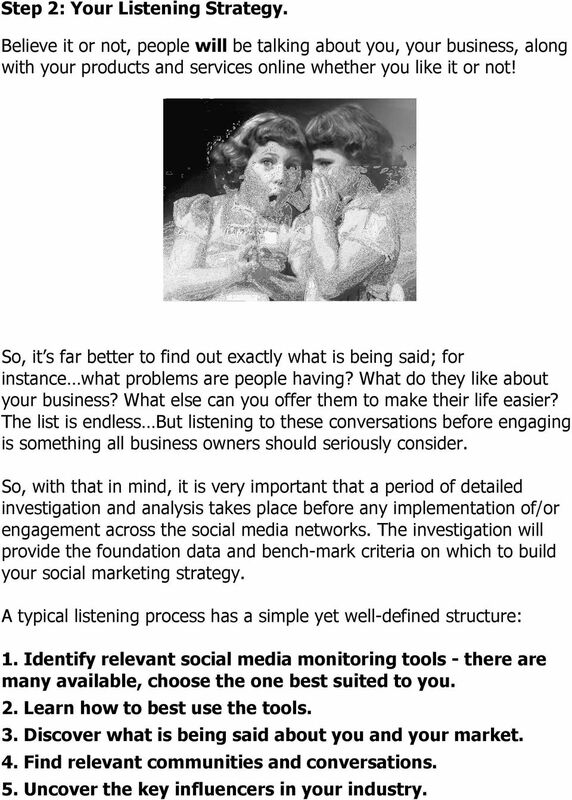 A typical listening process has a simple yet well-defined structure: 1. 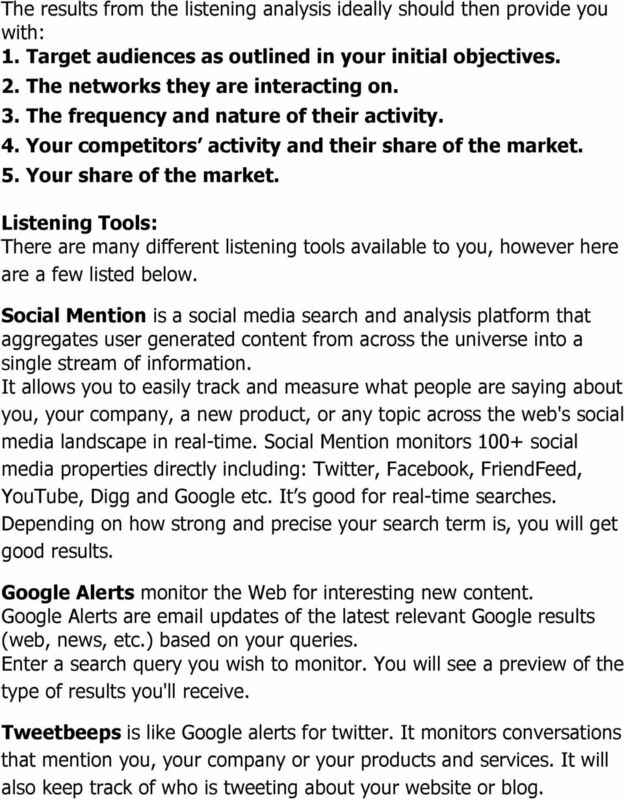 Identify relevant social media monitoring tools - there are many available, choose the one best suited to you. 2. Learn how to best use the tools. 3. Discover what is being said about you and your market. 4. Find relevant communities and conversations. 5. Uncover the key influencers in your industry. 5 The results from the listening analysis ideally should then provide you with: 1. 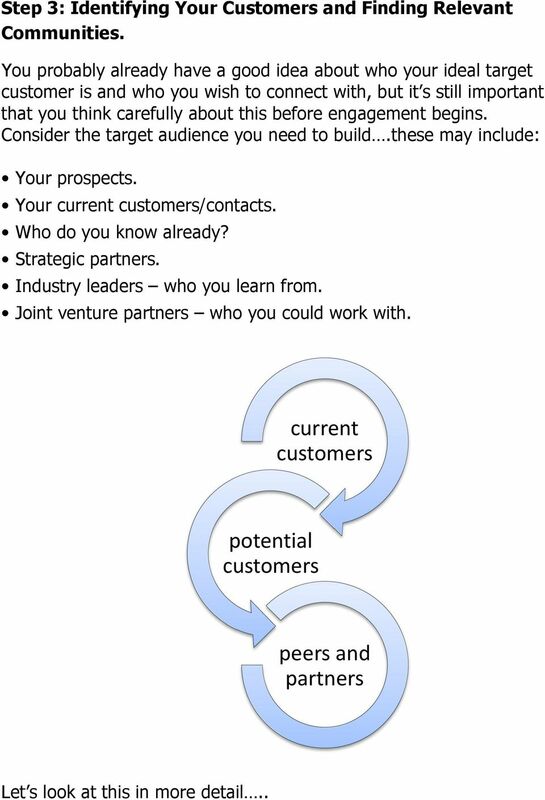 Target audiences as outlined in your initial objectives. 2. The networks they are interacting on. 3. The frequency and nature of their activity. 4. Your competitors activity and their share of the market. 5. Your share of the market. Listening Tools: There are many different listening tools available to you, however here are a few listed below. Social Mention is a social media search and analysis platform that aggregates user generated content from across the universe into a single stream of information. It allows you to easily track and measure what people are saying about you, your company, a new product, or any topic across the web's social media landscape in real-time. Social Mention monitors 100+ social media properties directly including: Twitter, Facebook, FriendFeed, YouTube, Digg and Google etc. It s good for real-time searches. Depending on how strong and precise your search term is, you will get good results. Google Alerts monitor the Web for interesting new content. Google Alerts are updates of the latest relevant Google results (web, news, etc.) based on your queries. Enter a search query you wish to monitor. You will see a preview of the type of results you'll receive. Tweetbeeps is like Google alerts for twitter. It monitors conversations that mention you, your company or your products and services. It will also keep track of who is tweeting about your website or blog. 6 Step 3: Identifying Your Customers and Finding Relevant Communities. You probably already have a good idea about who your ideal target customer is and who you wish to connect with, but it s still important that you think carefully about this before engagement begins. Consider the target audience you need to build.these may include: Your prospects. Your current customers/contacts. Who do you know already? Strategic partners. Industry leaders who you learn from. Joint venture partners who you could work with. current customers potential customers peers and partners Let s look at this in more detail..
7 Current contacts People you already know. Current & former colleagues. College friends. Professional groups & associations. Business card rolodex. address book. Employees at businesses you work with. Friends of friends. 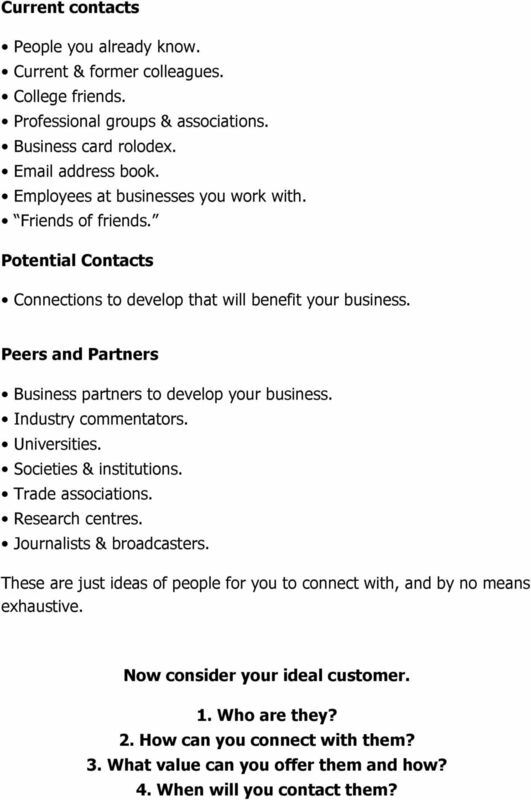 Potential Contacts Connections to develop that will benefit your business. Peers and Partners Business partners to develop your business. Industry commentators. Universities. Societies & institutions. Trade associations. Research centres. Journalists & broadcasters. These are just ideas of people for you to connect with, and by no means exhaustive. Now consider your ideal customer. 1. Who are they? 2. How can you connect with them? 3. What value can you offer them and how? 4. When will you contact them? 8 Finding Relevant Communities. So, we have set our goals, listened to what people are saying about our brand and have also considered the type of person we would like to engage with. What we need to do now is find out exactly where that person is. Where do they hang-out more specifically for us, what social networks are they active on. The thought process of Build it and they will come, just doesn t work with social media, we need to be proactive, provide relevant information and research the networks. The first thing many people think is I need to be on Facebook. But why is that? Realistically, they don t actually know why they need to be on there. They have no evidence or completed any research into the fact that this is where there customer base is active. So really what I m saying is that your time is valuable. Let s do the research, and find out which communities and platforms you need to concentrate your efforts on to engage with your target demographic. The precise process of locating and following potential customers through social media will vary from network to network. 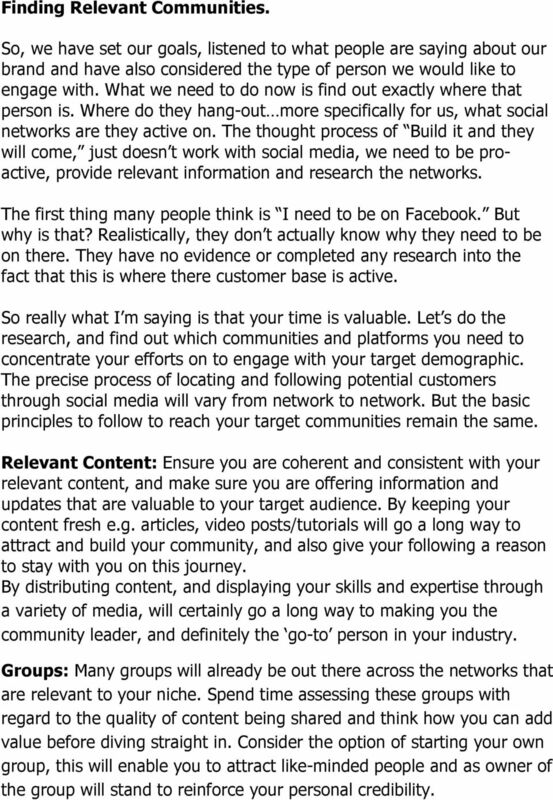 But the basic principles to follow to reach your target communities remain the same. Relevant Content: Ensure you are coherent and consistent with your relevant content, and make sure you are offering information and updates that are valuable to your target audience. By keeping your content fresh e.g. articles, video posts/tutorials will go a long way to attract and build your community, and also give your following a reason to stay with you on this journey. By distributing content, and displaying your skills and expertise through a variety of media, will certainly go a long way to making you the community leader, and definitely the go-to person in your industry. Groups: Many groups will already be out there across the networks that are relevant to your niche. Spend time assessing these groups with regard to the quality of content being shared and think how you can add value before diving straight in. Consider the option of starting your own group, this will enable you to attract like-minded people and as owner of the group will stand to reinforce your personal credibility. 9 Step 4: Developing a Content Strategy Showcase your expertise to attract potential clients, you want to create high-quality content and information that adds value to your potential customers and motivates them to work with you. 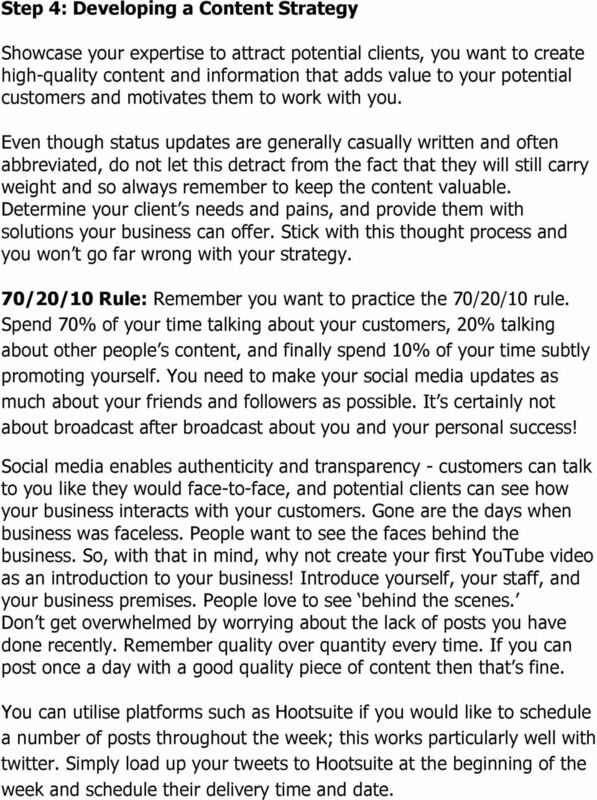 Even though status updates are generally casually written and often abbreviated, do not let this detract from the fact that they will still carry weight and so always remember to keep the content valuable. Determine your client s needs and pains, and provide them with solutions your business can offer. Stick with this thought process and you won t go far wrong with your strategy. 70/20/10 Rule: Remember you want to practice the 70/20/10 rule. Spend 70% of your time talking about your customers, 20% talking about other people s content, and finally spend 10% of your time subtly promoting yourself. You need to make your social media updates as much about your friends and followers as possible. It s certainly not about broadcast after broadcast about you and your personal success! Social media enables authenticity and transparency - customers can talk to you like they would face-to-face, and potential clients can see how your business interacts with your customers. Gone are the days when business was faceless. People want to see the faces behind the business. So, with that in mind, why not create your first YouTube video as an introduction to your business! Introduce yourself, your staff, and your business premises. People love to see behind the scenes. Don t get overwhelmed by worrying about the lack of posts you have done recently. Remember quality over quantity every time. If you can post once a day with a good quality piece of content then that s fine. You can utilise platforms such as Hootsuite if you would like to schedule a number of posts throughout the week; this works particularly well with twitter. Simply load up your tweets to Hootsuite at the beginning of the week and schedule their delivery time and date. 10 As social media is just that social don t forget to respond to your followers. It s not enough to simply post content, you need to respond to the comments and questions that visitors are asking. Remember, we are doing this for a reason, and that is to gain customers and increase our revenue. We cannot ignore this, so ensure you set aside 10 minutes in the morning and 10 minutes in the evening to respond to comments, especially if your updates have been automated via Hootsuite. It s important to determine the type of content that you are going to share. Depending on the channel, social media content can take many forms: blog posts, tweets, status updates, contests, quizzes, poll questions, infographics, videos, and photos. Due to Pinterest and Instagram, social media has become increasingly visual, so the use of video and photo images should be a major consideration. Not only does it appeal to different learning styles, but photos and video make it easier for customers and prospects to get a feel for who you are and what you do. Now we know the content and where we are posting it, we need to decide on a delivery schedule. 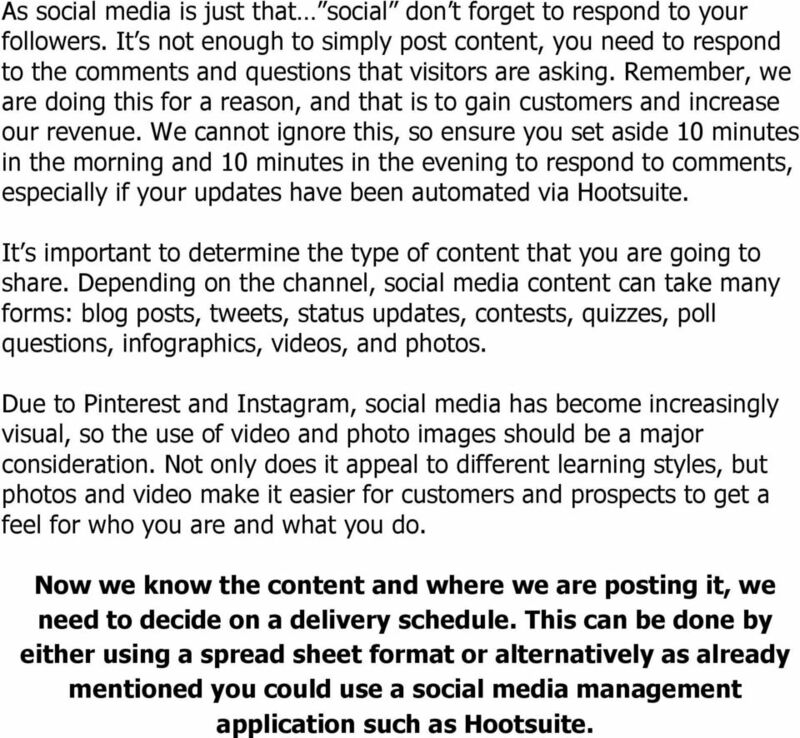 This can be done by either using a spread sheet format or alternatively as already mentioned you could use a social media management application such as Hootsuite. 11 Step 5: Tracking and Measuring Results. It s often said that it s difficult to measure the results of a social media campaign. So, as well as focusing on the smaller, campaign-specific metrics, such as traffic from twitter or the number of connections on LinkedIn, we can also look at how it helps to maximise the most important ingredients of your business, such as sales, profits, as well as customer retention and satisfaction rates? For instance, does your increase in website visitors correlate with higher sales? Are people that find your website from Twitter or LinkedIn then clicking on your product pages or going to the e-commerce section of your site? Hal Thomas, Content Manager at BFG Communications said; "We often approach social media like it s the destination rather than the vehicle," says Thomas. Marketers often want to "be on Twitter," but don't consider that it's actually a communications tool and that consistent action must be taken to engage a following. 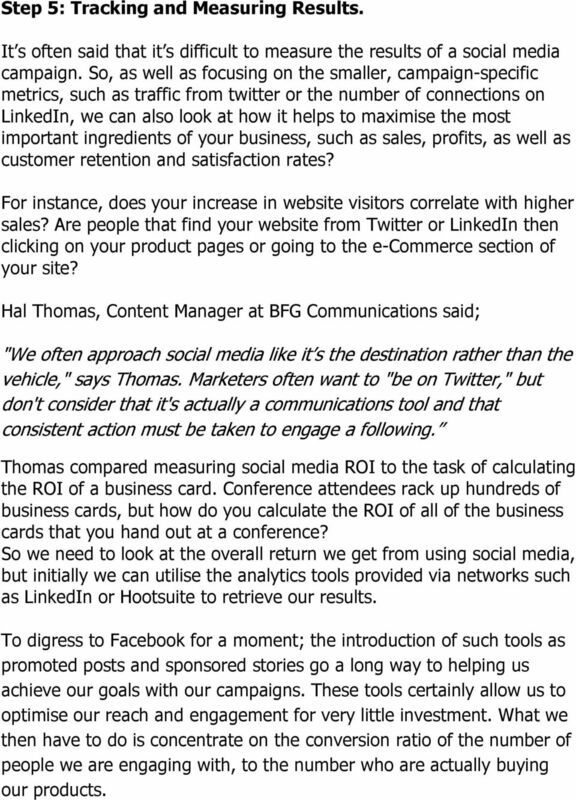 Thomas compared measuring social media ROI to the task of calculating the ROI of a business card. Conference attendees rack up hundreds of business cards, but how do you calculate the ROI of all of the business cards that you hand out at a conference? So we need to look at the overall return we get from using social media, but initially we can utilise the analytics tools provided via networks such as LinkedIn or Hootsuite to retrieve our results. To digress to Facebook for a moment; the introduction of such tools as promoted posts and sponsored stories go a long way to helping us achieve our goals with our campaigns. These tools certainly allow us to optimise our reach and engagement for very little investment. What we then have to do is concentrate on the conversion ratio of the number of people we are engaging with, to the number who are actually buying our products. 12 Social media metrics: Social clicks: Consider using as a URL shortener. Use its API to see how many clicks you get and what category of posts drives the most clicks. This is important because if you're being conversational you are very likely posting links that don't always lead to your site - they may go to YouTube, Pinterest, or blogs and other social media sites. So this is a good way to see how many clicks you are generating even if they are not to your site. Another way to measure the success of your activity is to record your current stats on your social networks. It is equally important to know where you stand now as it is to know where you want to get. Remember, no ROI calculation is complete without a concrete starting point. 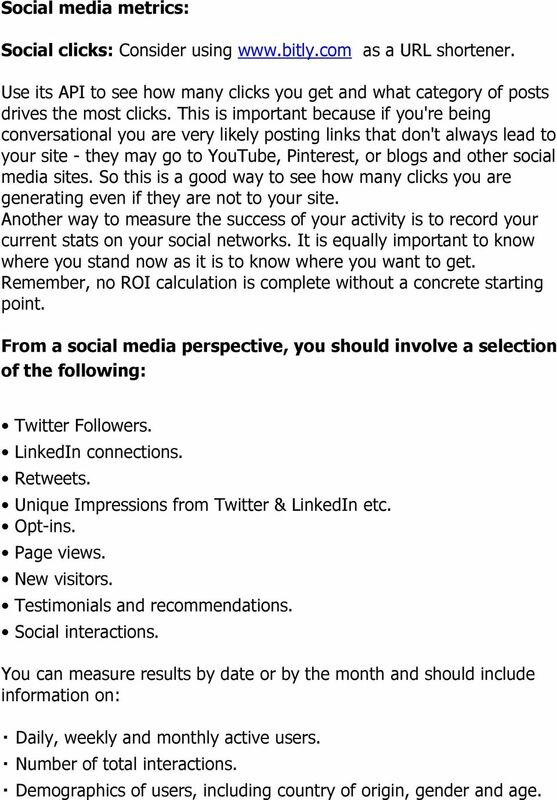 From a social media perspective, you should involve a selection of the following: Twitter Followers. LinkedIn connections. Retweets. Unique Impressions from Twitter & LinkedIn etc. Opt-ins. Page views. New visitors. Testimonials and recommendations. Social interactions. You can measure results by date or by the month and should include information on: Daily, weekly and monthly active users. Number of total interactions. Demographics of users, including country of origin, gender and age. Social Media and Content Marketing. A Guide for B2B Marketing Managers Social media and content marketing. A guide for B2B marketing managers On the Internet, marketing trends come and go faster than ever. Your guide to using new media A comprehensive guide for the charity and voluntary sector with tips on how to make the most of new, low cost communication tools such as social media and email marketing. 1 Measure Social Media like a Pro: Social Media Analytics Uncovered # SOCIAL MEDIA LIKE # SHARE Powered by 2 Social media analytics were a big deal in 2013, but this year they are set to be even more crucial. How to find your next job using Social Media? TIP SHEET 8 WAYS TO BUILD YOUR BRAND USING SOCIAL MEDIA Social media has changed the way our entire world works. Everyone has an equal voice and immediate access to vast networks of friends and followers. 11 Core Elements Of A Successful Digital and Content Marketing Campaign. RODA marketing is a full service digital marketing and consulting agency.